Speaking of must haves for back-to-school, I thought I'd share a little more info about why these are so amazing! 2. Thirty-One Hanging Organizer- I love all things related to organization, so when I went to a Thirty-One party and saw this, I thought that it would not only be great for home but also for school! I decided to hang mine on the bulletin board near my desk. You can hang a calendar on this, use the dry-erase board, organize papers, and keep track of your favorite pens or pencils! I can't wait to use it! 3. 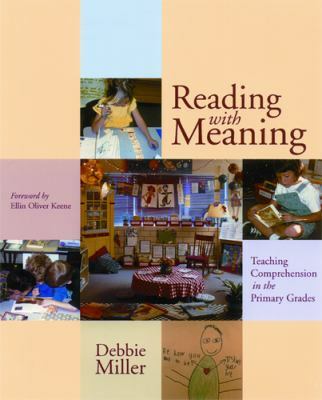 Reading with Meaning by Debbie Miller- I read this book a couple of summers ago and it completely changed the way that I teach reading. It taught me how to explicitly teach different reading strategies such as visualizing, predicting, inferring, along with many others. The book includes recommended book lists for each strategy and great examples of dialogue to use with your students. It is a great resource if you haven't read it yet! Well, I hope you all are surviving this crazy hot/dry weather! My hubby and I went to the state fair today and just about died in the heat. Stay cool everyone =) And be sure to link up with Farley at Oh' Boy Fourth Grade! I love my 31 Hanging Organizer. I have the exact one but in my office at home. Just found you through Farley's Currently! I love my laminator too... especially now that I know Sam's Club has a great deal on a huge package of laminating pouches. I really like the Thirty-One organizer. Never thought about it in the classroom. I love my laminator too! I also use it for publishing books. But that smell sure could improve. Glad to be a new follower.